Omega fatty acids, such as Omega 3's, are well-known to play a crucial part in the human ecosystem. In fact, the human body can't make Omega-3's internally and must rely on foods for it. The problem is...the majority of us aren't getting enough. Nearly 100,000 American deaths per year are caused by this key nutritional deficiency. There's more to supplementing with Omega fatty acids than ensuring you aren't deficient. How does it affect performance and health? What are the different types of fatty acids? Most importantly, what's the science behind the hype? Geoffrey Woo and Dr. Brianna Stubbs dive in and reveal all! We're giving our listeners a discount on our super-charged Omega-3 stack: Kado-3. A 10% discount will be automatically applied when you click on this link. You can receive a total 20% off if you subscribe for monthly shipments. Geoff:	Hey everyone this is Geoffrey Woo, your host of the HVMN Enhancement Podcast. I'm really excited to have a recurring guest and expert in a lot of things, Dr. Brianna Stubbs, our researcher here at HVMN. Brianna:	It's great to back on the podcast. It's been a little while since I was last on so it's always, always good to chat with you Geoff. Geoff:	Yeah, especially chatting with you it's kind of like an open letter to the world. I think there's just been a lot of open questions and just discussion around omega-3s, fatty acids, some new clinical research being published in terms of metanalysis and how these things affect certain type of outcomes. We thought it would be a good topic to de-mystify the whole world of omega-3s. Brianna:	We're gonna do our best! Geoff:	So lets dive into it. I mean I think it makes sense to start from very very high level and just ask the basics like what is omega-3, what is a fatty-acid, what do those terms even mean? Can we start from that level? Brianna:	So I mean let's start off with most fat in the diet is comes in the form of triglycerides and so that means you've got three fatty-acids bound to glycerol as a backbone. So when those are inside the body, your enzymes break off the fatty-acids chains and you get glycerol and three fatty-acids, and the fatty-acids can be used for energy metabolism. Geoff:	That's why it's called triglyceride by these three fatty-acids, one glycerol that's the triglycerides like a stable unit of fat. Brianna:	And so omega-3 and omega-6 fatty-acids are a little different. Geoff:	Well I think they either come in triglyceride form or phospholipid form. Geoff:	So I think what is interesting of a omega-3 or omega-6 is that they're unsaturated fatty-acid chains, meaning there's some double bonds in there. Geoff:	So for omega-3 that means that there's the last chain of like 20 carbons or 22 carbons, there's three empty or saturated bonds before the first unsaturated bond. For omega-6 there's six fully saturated carbon before an unsaturated bond and that's the distinction. Geoff:	Right. Can you explain what a phospholipid, what that form is compared to a triglyceride? Brianna:	So phospholipid means that the fat, the lipid part of it is bound to something that has a phosphate in it. And the reason why people are interested in omega-3s and omega-6 in terms of being a phospholipid is that our cell membranes are almost completely or very very high phospholipid content. And so the phosphate bit goes on the outside of the cell membrane and the lipid bit is on the inside of the cell membrane. So when you eat omega-3s and they're in phospholipid form it's a very important like structural part of all of the cells in our bodies. And I suppose a human in particularly interested in maintaining brain health and so looking at phospholipids inside the brain. Geoff:	Yeah. I think we can get into why DHA is especially interesting there as a form of an omega-3 for the brain but I think it's worth noting that you know typically in a cell membrane I think if you can just remember from our high school bio classes there's kind of like two tails and they were like one side is hydrophilic and one side is hydrophobic. Brianna:	If you think of a tadpole it's like the head of the tadpole goes on the outside and the tail of the tadpole goes on the inside and it's called a phospholipid bilayer. So there's two bits of phospholipid with the lipid tails pointing inwards and the phosphate heads on the outside and so with cells there's kinda other things that sit in this phospholipid bi-membrane ... bilayer but it's like a sea so the receptors and like glucose transporters and all of these things are slotted in and slotted out and it's how cells like communicate with the outside and it's kind of it's flexible that's what gives the cells a mobility to change shape and change function in order to work with the environment. Geoff:	And again I think the fatty-acid part as opposed to the phosphate and culling groups on it are like the tails, the inside of it and omega-3s are important part of that of cell membranes. Brianna:	What's really cool about omega-3s and other omega I think omega-6s as well have this property is that they can be broken by the body to form signaling molecules as well, so like prostaglandins for example. So not only are they structural components of our cells but they're also really important signals that regulate inflammation, and other interesting bio-active properties that these downstream metabolize of omega-3 fatty-acids have. Geoff:	Lets dive into that, but before that I wanna talk about and I know we used a couple of terms, saturated, unsaturated fats. What does that refer to I mean I can just jump in and say that usually for saturation of fat it basically means other single bonds in between carbons or double bonds being in carbons? Brianna:	So if it is unsaturated so if you have the double bond then there's kind of the potential for other things to jump in there and react. So unsaturated fat so kind of reactive lets just say than saturated fat. So saturated fats they tend to be like solid at room temperature and they don't tend to go rancid, whereas with unsaturated fats with these double bonds they tend to be more like in a liquid form and then also they can react off with other things that can tend ... cause them to go bad. Brianna: -that's a different question. Geoff:	... coarse way to discuss it but I think that's why if you look at it nutritionally well there's total fat content, there's polyunsaturated fats, monounsaturated fats, and saturated fats and that's what it's describing. It's describing the number of carbon double bonds in a fatty-acid chain. Brianna:	So I mean just to clarify what you were just saying that a monounsaturated fat would be that there's one double bond, a polyunsaturated fat would be that there's multiple double bonds and so omega-3s are polyunsaturated fats. Geoff:	And I think it's also worth talking about like medium chain triglycerides, MCT oils are very popular topic in terms of something that supplement for a ketogenic diet you might of heard of a bulletproof coffee or a fat coffee. A lot of people use MCT oils so how does that fit into fatty-acid land? You wanna breakdown like kind of other kind of fat compounds out there. Geoff: I think there's specifically six to twelve. Brianna:	Six to twelve, sorry I was in the middle.And so what's kind of interesting and unique about those is that when you eat those they don't get transported in quite the same way as like longer chain fats. They go in the portal circulation to the liver rather than going into the lymphatic systems. So normally fats empties into the lymphatic system it's a very interesting if you've ever seen a video demo somebody eats a very very fatty meal you can take a blood sample spin it down and you can see like the fat kind of appear in the blood directly and that's because when we eat like longer chain fats that doesn't go it's not reprocess by the liver it goes in the lymph and it empties out into the blood before it's processed. But medium chain fats are different because they go into the portal circulation straight to the liver and that is why these fats are kind of considered to be ketogenic because they're going to the liver and also short so the liver can quite rapidly cleave them down into the two carbon ... four carbon, sorry, ketone units. Brianna: -four, two lots of four. Geoff:	Two lots of four so it's one of the most efficient forms of fat that converts in the ketones. Brianna:	So I think this is a kind of an interesting point to say that even in this first five minutes here we talked about lots of different types of fats and so I think it's worth finding out people shouldn't just like put all fat in like one bucket that certainly some like subtleties involving like what fats are doing different things to your body lets just say like fat isn't one big entity. Geoff:	And I think that is the same way you look at other macro-nutrient groups, we talked about fats as one macro, protein as one macro and carbohydrate is a third macro. This is not you know glucose is very very different from like a polysaccharide in like potato. Brianna: Versus fructose, versus ... yeah exactly. Geoff:	So there's similar kind of nuances with fat and the categories of fat. Geoff:	22 for DHA, 20 for EPA, and a lesser known one alpha linoleic, which is separate from alpha lipoic acid, which is interesting from a antioxidant perspective, but alpha linoleic acid is also an omega-3 fatty-acid, usually found in plants that has 18 carbons and I think for the organic chemistry nerds or wanna be nerds 'cause if you're already a nerdy you probably already know this it ALA has three double bonds EPA has five double bonds, and DHA has six double bonds. So these are fairly long fatty-acid chains. Geoff:	So I think before talking about each specific type of fatty-acids I think it's worth talking about omega-6s and omega-3s. So we talked about omega-6s and I think the interesting thing to note there is that most studies of paleolithic humans the diet typically consisted of around a 1 to 1 ratio of omega-3 fats and omega-6 fats if you look at the data today we're eating a lot more omega-6s. Brianna:	A lot more like red meat that's where a very rich in omega-6. Geoff:	Well I think the distinction there is like because the red meat that we eat today is often fed by grains. Geoff:	And a lot of plant oils are higher in omega-6s. Brianna:	Is that why people like eating grassfed beef? Geoff:	Yes. 'Cause the data there is of grassfed beef has higher omega-3 contents, exactly. That's where it's interesting for like the existing farming practices have shifted our omega-6 to omega-3 ratio. I was actually looking at the numbers this afternoon, preparation for this conversation and Japanese population that often eats a high amount of fish has a 4 to 1 ratio of omega-6 to omega-3 and American population-centered-western diet are up to 15 to 20 x omega-6 to omega-3. Brianna:	So that's where supplementation kind of comes in to try and rebalance that ratio back to what 1 to 1. Brianna:	-it's making it harder and harder for the consumer to really work out what they getting in their diet if there's that's much difference between a pound of grassfed beef and a ground of regular processed beef. You're gonna not ... it's gonna be difficult to know what you're getting and then also the as you said shift towards more processed foods it gets more and more difficult for people to work out what they're getting and also then to up their say omega-3 ratio to be more like in fitting what it used to be. Geoff:	-and your phospholipid your cell membrane is gonna change. Has interesting implications to like the different signaling or receptors that are exist on the cell. Brianna:	Yeah, of course. I can't imagine that we understand all of these fully, fully but it's and it's certainly something that's kinda gonna be interesting to watch unfold. Geoff:	Yeah. I mean I think helps set up really big context of why omega-3s hasn't studied so much. I think from a macro-layer okay there's clearly a big shift in terms of the ratios, omega-3s have some early data around a ton of different interesting biomarkers, anti-inflammatory stuff. I think it's what are those and what is it over-hype for? What is it under-hype for? Can we start breaking down some of the indications for omega-3s? Brianna:	I think one thing that's really interesting is it's kinda hard when you're trying to cut through the literature and look at when people have measured just like, okay what is the level, ratio in people's blood or tissue samples, like looking for correlation versus the data that you get when you actually do supplementation. So as you said a lot of early interesting correlational data a lot of therapeutic implications an off omega-3, omega-6 ratio that aren't always rectified with supplementation or aren't always recapitulated when you add in supplementation. So it's kind of as I supposed when we think about the evidence or when people are out reading the evidence look to see whether it's like a correlational kind of study or whether it's interventional kind of study. Geoff:	Like a randomized control trial. Brianna:	Yes. And I mean there's nothing ... I mean there's definitely still valued to the results of correlational because being deficient in something and knowing that that has a relationship to a certain clinical disease that's useful and important. Brianna:	And it's not necessarily incorrect. But I think this is where the headlines kind of get confusing because people might be like, "Omega-3 deficiency is associated with higher cardiovascular risk." And on the other hand as we might discuss in a minute, like a recent metanalysis comes out and says, "Oh well, omega-3 supplementation not associated with an improvement in cardiovascular risk." You're like wow this is like seems so conflicting. Geoff:	But it might not be if you actually read the subtleties right. If you're deficient then you're probably something is going wrong. Geoff:	But if it's like, if you're sufficient adding it then you might not be enhancement, right? Brianna:	Yes, so it's kind of difficult Joe Bloggs from the street to know whether they're deficient or not. Brianna:	And so that's why I guess when you're thinking about what you supplement with like personally if so long as it's not going to do you any harm if there's a chance you might deficient then it might be worth supplementing. Geoff:	Right. Maybe that's a good way to start this conversation talking about specific indications. Lets talk about clear deficiencies of omega-3 associated with different types of diseases. Brianna:	I mean cardiovascular risk is one that is very much talked about. Deficiency in omega-3 generally, there seems to be a strong relationship there. Geoff:	Yeah and I think you know one of the things why we're so interested as a cognitive nootropic interested company DHA. DHA is 40-50% of the omega-3s found in the brain. It's one of the predominantly available or used as a fatty-acid in the brain. A lot of babies are in prenatal care people up their omega-3 count because it's so important for the developing brain. I think there is a similar correlation in terms of deficiencies associated with like lesser neurological function. What else do we see that's out there, that's caused by deficiency of omega-3? Brianna:	Again I need to double check this but I believe there's joint health implications for being deficient in omega-3 and inflammation associated with joint pain say associated with being deficient in omega-3. Geoff:	And I think moving towards improving our enhancement or better outcomes, I think antiinflammatory effects are one of the bigger areas for omega-3 to show good data on. Brianna:	Well mainly because as we mentioned that earlier on that they're being kind of cleaved up into all of these active signaling molecules and they're not only kind of in the cell membrane but they're kind of doing, doing signaling as well. Geoff:	How does that work? Do these things get converted into hormones or signaling you know ... unpack it a little bit. Brianna:	So, on the very high level the cell is activated by stress. So something happens to the cell, mechanical trauma or some chemical signal comes in that causes mobilization of the phospholipids to be like cleave by these enzymes called Phospholipase A. So this enzyme breaks off your fatty-acid and then there's a series of other enzymatic reactions that can convert the fatty-acid into a number of different signaling molecules as a big family of them prostaglandins, leukotrienes, resolvents, protectants, there's quite a long list of bioactive things that can be formed by omega-3 fatty-acid. Geoff:	Right. I think one thing that is interesting is that the different ratio of omega-6s and omega-3s and is implicated in like how these things are used as signaling molecules. Brianna:	So I believe that they are like the cleavage of them from the phospholipid is kind of like indiscriminate but then once they're released they kind of funnel off down different pathways or actually kind of opposite from one another. Geoff:	So I think that's why it's interesting like okay if you just have 15 to 1 ratio of omega-6s and omega-3s now and like how your cell again react to a stressor when we're Paleolithic Stone-Aged people versus now, given the different ratios you have a different downstream effects. As a scientist it just seems like "Okay, there's probably some interesting questions to be answered here." Geoff:	Or either find like a frozen arm of someone on Everest buried up there 200 years ago so maybe like that's a cold enough sample. Geoff:	So we talked about DHA a little bit as one of the dominant fatty-acids in the brain, but of course as we get more and more specific here there's different types of omega-3s. We haven't talked to much yet about EPA or ALA and to be specific, alpha-linolenic acid. Geoff:	Do you want to talk about ... not talk about that add color to those different more lesser discussed omega-3s. Geoff:	Mostly like seafood especially. Brianna:	... seafood especially. ALA and alpha-linoleic acid that is mainly from plants like flaxseed things like that. But what's kind of interesting is that ALA, alpha-linolenic acid, can be converted into EPA and DHA inside the body as whereas ALA is essential fatty-acid. Geoff:	An essential doesn't just mean like it's important, it means that it has to be consumed. Brianna:	You can not make it inside the body. Geoff:	So you can make DHA and EPA from ALA, which is cool, so there's actually two essential fatty-acids. So you have the omega-3 essential, which is Alpha linolenic acid and it's also a thing called Alpha linoleic acid, which happens to be the essential fatty-acids from omega-6s. Brianna:	Just to confuse us. Geoff:	Yeah which is super interesting. You can also just eat linolic acid and that will form the omega-6 fatty-acids and the sources for linolic acid tend to be from Safflower, salicornia oil, primrose oil, which is ... it's not an obvious reason why certain flowers to me at least have linolic and things like what flax have alpha-linolic. And I think we've been particularly precise with ALA because there's also common supplement called Alpha-lipoic acid which is different again from Alpha-linolic acid. Can you talk a little big about why Alpha-lipoic acid is something of interest? Brianna:	So we're interested in Alpha-lipoic acid because it's a very potent antioxidant and there's merging clinical research about it being use to improve the oxidative state of the body. So that's kind of interesting when you're thinking about metabolic health, whether it can be a lot of oxidative stress. It's not the same, unfortunately it's a little bit like MCTs and MCTs when we talk about Monocarboxylate transport or medium chain triglycerides when we talk about ketones. This is another thing where two very very closely related things have the same abbreviations you have to be really really careful when you look on the label, when you read it in a blog post, which one you're actually reading about. When we talk about an antioxidant we're talking about alpha-lipoic acid, and when we talk about an essential fatty, omega-3 fatty-acid we're talking about alpha-linoleic acid. Just to be really careful. Geoff:	One syllable difference but a world of difference there. And I think antioxidant I think actually, is actually a nice segue into things that we should be thoughtful of when we look at omega-3s. So big problem or thing to be concern about is the oxidation or the rancidity of omega-3 oils because omega-3s with their unsaturated bonds are especially prone to react with the oxygen and turn rancid and typically what that means is they react to oxygen in forms seems like peroxides and things that are just not good for you. Some of the odor or smelliness from fish oils or like bad fishes because they've gone rancid. So I think that's actually kind of interesting with like really good omega-3 products like KADO-3 usually paired with an antioxidant so it mitigates some of the rancidity functions when you have oxygen going ... when you're producing a supplement. Can you talk about like why would peroxide be bad? Like why is even peroxide bad? Brianna:	So you end up or if you look at their chemistry structure you end up with this like oxide, two peroxide radical and it just it can cause damage to DNA, it can cause damage to various other processes inside the cell. Geoff:	So it's like a free radical. Brianna:	Means it has a lot of charge. So it's like that means it's kind of reactive. And it does causes havoc. Brianna: Free radical would be different to a peroxidized lipid though. 'Cause a free radical would be free. Geoff:	Okay. So like a proton electron floating around as opposed to tied to a bigger molecule. Geoff:	Okay. End of fact is that basically there's a charged molecule that's like sucking or breaking things off from things that they shouldn't be right? Or you're mutating DNA or mutating RNA. Brianna:	Yeah, and sometimes if that damage can't be repaired that's what leads to long term damage in cellular function. 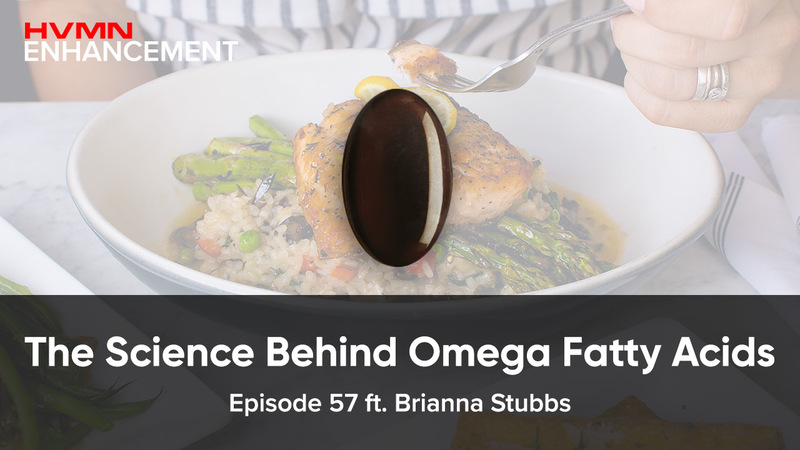 Geoff:	Yeah I think is there anything else that I think would be helpful to de-mystify a little bit about omega-3s I think we went pretty full stack going from definition of fats, down to different categories of fats down to omega-3 versus omega-6. Geoff:	Yeah lets do that. Let's absolutely do that I think that's one of the things I think more people should be talking about. What is it good for and what is it not good for? Let's not hype up everything. What is it not good for? Brianna:	So we talked about the correlations between like cardiovascular disease and omega-3 deficiency. Geoff: I believe we were referring to metanalysis published like just this month. Brianna:	77,000 I knew there was a seven in there. Brianna:	-probably gonna improve. It's likewise with one thing that's actually relatively well validated is like mood and cognitive decline which is great because we believe that Kado's like a long term investment in your brain health and so there's especially with people who've already got like some sort of like mood disorder, supplementing with omega-3s has on several occasions been shown to work there. Geoff:	That's a positive sign. Brianna:	Yeah, that's a positive sign. Improves mood in people with mood disorders. Geoff:	It's not gonna treat someone that rescue function with someone who has full-blown Alzheimer's. Brianna:	Yes I think as with all things supplement consider whether if there's any chance of doing harm and which case and in the case of omega-3s I think that's very very very minimal chances it's gonna do you any harm. Geoff:	It's like a food. Geoff:	How about on the sport science side I mean think there's some interesting if you know look at Volek Phinney's book Art of Low Carbohydrate Performance there's interesting data around anti-inflammatory recovery benefits from omega-3s. Can you expand on that? Geoff:	But I also think like omega-3s themselves are associated with lower CRP. Geoff:	Which is an antiinflammatory marker so that's interesting it could be helpful for ketogenic diet in terms of balancing the ratio of omega-6s and omega-3s but also directly seems to be good emerging data around its effects on just lowering anti or inflammatory biomarkers itself. Brianna:	I mean as you said earlier on it's like an area of active inquiry and that's like studies of different sizes are being run on like different supplements, it's just quite a lot of things that can be kind of fiddled around with. Like dose, ratio of DHA to EPA, like many things that can change so I think it's like kind of complicated trying to weigh through the literature. Geoff:	Too much of it. I think that seems to cover a lot of broad base I mean I think it would be helpful to just discuss a little bit of high level of why KADO-3 is KADO-3. And I think it's worth demystifying some of our product thinking processes as we develop this stack in directions and thinking of how we think to evolve it given the new research and new data and the new availabilities of interesting compounds out there. I mean I think the initial instinct around Kado-3 was that it's actually as a nootropic cognitive focused company wanted to really ramp up the ratio DHA to EPA, again DHA associated with cognitive performance, associated with being the primary phospholipid bilayers substrate of neurons and I think most omega-3 products out there and just in fishes in general just in seafood tends to be heavily skewed towards EPA so could we come up with a very purified DHA form or we really ramp up the DHA was one of the initial entry points into thinking about an omega-3 product design for cognitive performance. Brianna:	Then what I really like about Kado-3 is the fat soluble vitamins, vitamin D and vitamin K makes it really like complete stack when we talked a little bit about deficiencies in the diet and deficiencies as resulting, occurring as a result of lifestyle and vitamin D certainly because we can actually synthesize ourselves when we're exposed to the sun, but most of us now work indoors so we don't get as much sun exposure so actually many many many people are deficient in vitamin D and actually the recommended the rDA for supplementation is on the low side as well. So pretty much anyone can get benefits from supplementing with vitamin D in and you're gonna take up more vitamin D if you take it with fat because it's fat soluble vitamins. So it pairs really nicely with omega-3s. Geoff:	Right, and I think if we're looking at vitamin Ds make sure you're getting vitamin D3 not vitamin D2 because it's a lot more bioavailable in the D3 form. So if you're looking at labels and getting the right type of bioavailable form of D make sure it's a D3. Can you talk a little bit about K as well? Brianna:	Vitamin K is also like a I believe it's either a co-factor or it contributes directly to sphingolipid formation and it's sphingolipid is another lipid component of like neuro and brain cells so also important for maintaining brain function. Geoff:	And also there's a merging literature around on synergies between again fat soluble and then it also working while supplementing vitamin D. So yeah the K, D and omega-3 so that's K-A-D-O-3. So how about A? Antioxidant is kind of the way we think about the A part of KADO-3 the current antioxidant that we're ... in KADO-3 is Astaxanthin, which is typically found in krill oils. It actually gives what KADO-3 that red color actually. So lot of when the shrimp are kind of pinkish they're eating lot of phytonutrients and they're synthesizing astaxanthin, but I think besides just talking about specifically astaxanthin. Can we talk about the purpose of why it's in there, an antioxidant? Brianna:	In terms of like the formulation of a stack which you mentioned a little or in terms of the body? Geoff:	Well, both. I think we talked ... I'll talk about the formation of the stack and you can talk about the use can in the body then. So again form the rancidity perspective and oxidation perspective having antioxidant stacked within omega-3 makes a lot of sense to mitigate any oxidative damage. So actually if you look at the manufacturing process our omega-3 products, the ones that do it right make sure it's vacuumed seal in an oxygen-less environment. Again if you have a lot of oxygen, oxygen is a very reactive compound oxidizing omega-3s as it pops out. So if you do it in a very vacuumed safe environment and you put antioxidants as part of the process or part of that stack you really mitigate the factor rancidity. Brianna:	It's really cool that antioxidant can work in like that kind of outside of the body kind of ways and antioxidant as well as inside of the body. That's kind of cool. But inside of the body it's like a very similar process you've got like oxygen, free radicals and also peroxidized lipids that want to cause damage to the cells and so if you've got an antioxidant they can like scavenged those and have a protective effect. Geoff:	And I think it's actually probably opens up a new can of worms. I think there's a lot of discussion on antioxidants probably, do they ... there's so many different types. Do they work? Are they going to the right spot? Are they bioavailable? Brianna:	We should do another podcast about that. Brianna:	So one thing that really interest me as an athlete is people were very interested in antioxidants for recovery from exercises because exercise causes oxidative stress that's where the "D" was coming from. So if you took antioxidants you could blunt some of that oxidative stress from the body however some people have proposed in some evidence suggests if you blunt the stress on the body then you get less adaptation, less benefits from the training, so there was a period of time where antioxidants were really really invoked first in exercise science and now there's been more of a question mark there. Some oxidative stress is helpful. Geoff:	Right and I think that's for a lot of our discussion before puridizing stress, puridizing training, puridizing nutrition is interesting or and that's probably not a topic to talk about. How do we ... again as we get more and more nuance in the field of human performance in physiology like I don't I think we've at least from me I can see it for myself there's no one size fits all like master plan for every single for ... that applies to all humans. Brianna:	No, you're certainly right, but I do think, I feel particularly bullish around omega-3 and vitamin D supplementation particularly vitamin D in modern society most people will benefit from supplementing we use like their clothes analogy that I like to use sometimes. It's like a hat that will fit like more people as opposed to like a sweater that won't fit like half the people. So I think there are some things to where given our lifestyles it's advisable to supplement. Geoff:	Cool I don't think there's nothing more to add to that I think it's a good way to close this conversation actually. So hopefully for our listeners out there this de-mystifies what the hell even omega-3s are and gives you a little bit the product thinking and the physiology and the biology behind what goes into KADO-3 and it's really cool to see that it was one of our stacks we kind of launched quietly but it's really grown to be one of our most popular sellers. Something that we're actively R&D-ing and looking on improving and hopefully we'll have an update on that specific product hopefully to announce in the coming months. It's a cool product I like macro-dose it personally myself. We recommend two to three pills but often times I eat five, six a day. I know a lot of my friends feel that macro-dosing on KADO-3 is more beneficial they feel it more. Geoff:	It's happened more than once where I was like again plural of anecdotes is not data but I think it's like as someone who is like I still believe there's still some signal into anecdote it could be something that's interesting there. Maybe it's only that we actually do research on. But anyways thank you so much for tuning in. It's always fun to talk science and dive deep into conversation around Brianna and so it's always a fun conversation. As always give us good ratings, recommend us, follow us, subscribe, you know our channels iTunes, Google Play, Sound Cloud and now of course Spotify. Thanks so much and we'll see you next week. Bye! You can find and subscribe to the HVMN Enhancement Podcast on iTunes, Spotify, and Youtube.